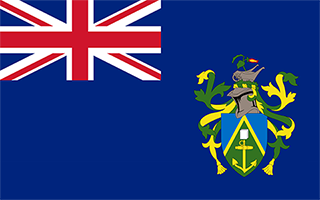 Pitcairn with its capital is located in Oceania (Oceania, islands in the South Pacific Ocean). It covers some 48 square kilometers (about three-tenths the size of Washington, DC) with 54 citizens. English is the language commonly spoken used in Pitcairn. This country shares no land borders with another country. Pitcairn are a loosely grouped handful of tiny islands in the remote South Pacific, farther from any continent than any other inhabited island. The climate is humid and tropical (the Tropic of Capricorn lies a short distance to the north), with average temperatures ranging from 60°F (16°C) on winter nights to 85°F (30°C) on summer days. Rainfall is moderate with no strong seasonal pattern, just a bit wetter in the winter. The new museum in Adamstown contains artifacts from the Bounty (including Fletcher Christian's Bible), stamps, issues of National Geographic featuring the islands, and other items of local interest. One of the ship's four cannons is planned to be displayed here. To reach someone Pitcairn dial prior to a number. The local cellular networks are operated on 900 MHz. Websites typically end with the top level domain ".pn". If you want to bring electric appliances (e.g. battery chaarger), keep in min the local 230 V - 50 Hz (plugs: I). The sign for the locally used currency Dollar is NZD.